Gerald Boulle first played in the Championship section in 1956, and made his last appearance there in 2001 at the age of 65. He was not the oldest ever competitor, that honour probably goes to Edgar Hill. Apart from breaks in 1957, 1958 and 1962, Gerald was a regular contestant in the A section, and competed for the Durban title a record 43 times, just one more than myself (Keith Rust). We played 25 times in the club championships - after losing my first 3 games to Gerald, I caught up rapidly and eventually scored 16 wins to his 5 with just 4 draws. We also played a similar number of games in other club events and in open tournaments. Gerald was at his best in the 1960's and 1970's. He almost secured the title in 1960 but lost a playoff match with John Blackburn. Gerald first became Durban champion in 1963, and he then proceeded to win the title five times in a row, before losing it in 1968 to multiple champion Moss Kolnik. Probably the greatest of his 8 title wins came in 1975, when he regained the title with the very fine score of 8 points out of 9. He beat defending champion David Walker in their individual game, and only suffered one loss to Bill Gregory. 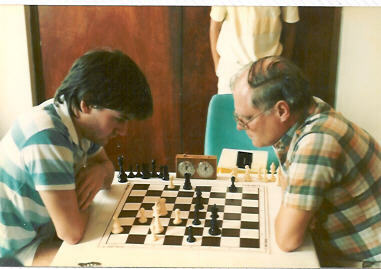 Gerald had amazing endgame technique and I learnt a lot from studying his games. One of his weaknesses was that he had a fixed opening repertoire - for example, if I had the Black pieces, then I knew that Gerald would play the Morra gambit against my Sicilian defence. It took me about 10 years to find an antidote! I was much more successful with the Pirc defence against him. Gerald won the Natal Closed title on 7 occasions between 1967 and 1979.